The South African attack continued, with the PNG backline able to hold them off, but not able to clear the ball back past the centre. South Africa got two goals on the board through Benji Sobetwa and Vuyisile Sokoyi. Jurie Wessels took a mark in the goal square, but played on and the desperate PNG defence managed to get a touch on it as it crossed the line. A free kick awarded to South Africa's Thabiso Phakedi for a tackle resulted in a shot from 50m out on the boundary, which was also touched on line. The game proceeded at lightning pace, with desperate tackling by both sides. Marokoane had a running shot on goal for the Lions, but it drifted wide. David Topeni was providing good run out of defense for PNG, but the South Africans kept attacking, playing on quickly and using precision passing to set up chances. Paul Philip slotted through a skillful goal for PNG against the tide to close the gap, but the South Africans kept pushing forward. A PNG kick out on the full on the siren gave Valele a chance to put the Lions further ahead, but his kick from 50m fell short. PNG went forward early in the second quarter, but Theo Gavuri missed his chance at getting the Mozzies' first for the quarter. A few minutes later some great roving off a boundary thrown-in on the half back flank by Moshoeshoe led to another South African forward charge, ended in a great snap goal to the Lions. Amua Pirika had a chance to get one back for PNG but his shot went of the side of his boot. PNG received a 50M penalty off halfback, which set-up a clever play-on and attacking move into the forward 50, but only one point resulted. At the 10 min mark, Moshoeshoe took a courageous mark and was crunched from behind. The resulting 50m penalty saw another entry into the scoring zone, but the Mozzies repelled the attack and another fierce (this time legal) bump by PNG's Ezra Gotuno typified the tension in the contest. The South Africans finally broke through for another goal from a set shot at the 12 minute mark, which was the final major for the quarter. 6 minutes in, Scott Johnson snapped a point for PNG. Two minutes later, Gregory Ekari towered over his opponent to mark and waltz into the goalsquare - finally getting PNG a goal to reward the efforts of the previous 30 minutes of football. In this arm-wrestle of a contest, it was to be the only goal kicked by either side for the quarter. The tackling of both teams impressed the crowd. Emmaus Wartovo put on an impressive spoil and led the pressure to hold the ball in PNG's half, but the Mozzies couldn't convert their opportunities into scoreboard pressure and the Lions were able to hold on well. With the Mozzies eager to break out of the deadlock in the middle of the ground, PNG's John Ikupu received a free kick in the centre early in the final term, moving forward to Gideon Simon, who found Amua Pirika on the lead. Pirika converted from 40m on a slight angle, bringing the margin back within two goals. Shortly thereafter, Pirika took another mark in the centre, and received a (double) 50m penalty from an overly exuberant attempt at a spoil from his South African opponent, which put him in the goalsquare, dead in front. 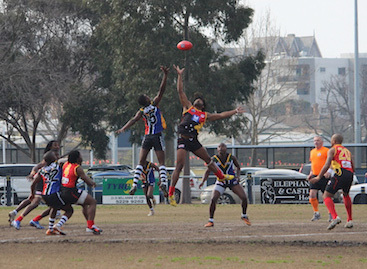 The resulting goal brought the scoreline to South Africa 5.11 to PNG 5.6. PNG attack off half back, but Tshoboko Moagi made it back to thwart attack at defensive 50, spearing the ball back into the Lions' scoring zone. Phakedi split the middle of the goalpost to give the Lions breathing space. PNG received a couple of (possibly lucky) free kicks, with Gideon Simon running well through middle, and Amua Pirika providing a great target up forward, goalling from 45m out. South Africa went forward, desperate to answer, but a reckless soccer shot on goal resulted in a free for a kick in danger. Ikupu took a great mark for PNG, but his kick toward the centre resulted in a turnover to the Lions. Great unselfish team play resulted in handball to a loose Lion player in goalsquare provided South Africa with some breathing space, with just four minutes to go fast. Sensing victory, South Africa lifted, getting numbers to every contest. The Lions started trying to maintain possession and run down the clock, but the tactic backfired when a kick backwards saw a turnover, Brendan Beno marking and playing on to kick a goal and bring the margin back within a single goal. A free kick paid downfield to South Africa proved costly for the Mozzies, and South Africa kicked the sealer from a set shot 20 metres out. PNG had one last roll of the dice with Beno finding Agita in range, but Agita's kick was rushed through on the siren. The talk in the huddles post match was that South Africa had beaten PNG at PNG's own style of footy. The Lions will go into the final four confident that they can keep pace with the best. The Mozzies, for their part, played 20 minutes of good footy in the last quarter, but paid the price for not respecting their opponents early on. Still, the Mozzies will scrape into fourth place on percentage in front of Canada, and still have a shot at lifting the Cup. At their best, they are capable of beating any side and can definitely win from fourth.